Caption slip reads: "Photographer: Glickman. Date: 1953-01-12. Reporter: McDowell. 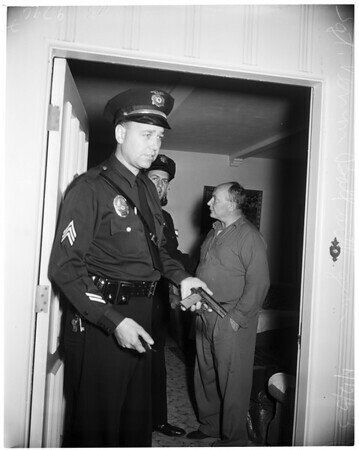 Assignment: Drunk with gun, 13946 Sherman Way, Van Nuys. 113-114-115-116: Police search Raymond Fields. Sgt. Vernon Ball with gun as officer Sidney Riegel holds Raymond Fields. Raymond Fields goes into police car. Going to file complaint is Mrs. Aino Fields and police."